Facebook owns the world's largest photo library, and it now has the technology to match almost all the faces within it. Yes, even the ones you don't tag. Facebook announced last week that it has developed a program called "DeepFace," which researchers say can determine whether two photographed faces are of the same person with 97.25 percent accuracy. According to Facebook, humans put to the same test answer correctly 97.53 percent of the time -- only a quarter of a percent better than Facebook's software. The takeaway: Facebook has essentially caught up to humans when it comes to remembering a face. The program was developed by three in-house Facebook researchers and a professor at Tel Aviv University. 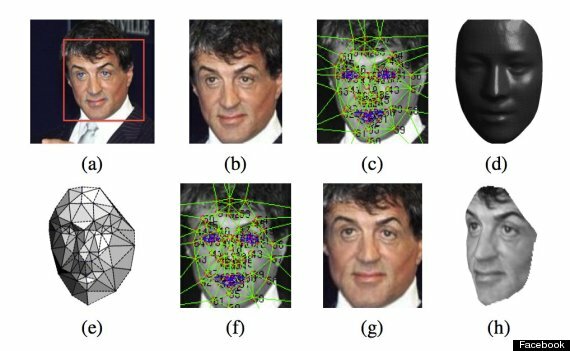 As an example, the developers show in a paper on the program that DeepFace can successfully recognize that this is Academy Award winner Sylvester Stallone. Already, Facebook's facial recognition software is able to suggest friends to tag when you upload a photo, using information like the distance between eyes, nose and eyes in profile pictures and already tagged photos. But those results are much more inaccurate than DeepFace, which uses techniques from deep learning, a field of artificial intelligence specializing in understanding irregular types of data. In order to better match faces, the researchers created a "neural network" in its software meant to imitate animals' central nervous system. For now the program, first reported on by the MIT Technology Review, is only a research project and will not affect the 1.23 billion people who regularly use Facebook. But CEO Mark Zuckerberg has expressed deep interest in building out Facebook's artificial intelligence capabilities when speaking to investors in the past. His ambition actually stretches beyond facial recognition to analyzing the text of status updates and comments to decipher mood and context. There's a business purpose behind all this intellectual enthusiasm: Understanding all the information we post on the social network is central to Facebook's business model, which leverages data to personalize ads so you'll be more likely to click on them. Facebook's growing ability to recognize you when a friend uploads photos from a vacation together has caught the attention of privacy advocates and government officials alike. For example, more privacy-conscious European governments have already forced Facebook to delete all of its facial recognition data there.